ระบบการกระจายเสียงดิจิตอลรวมถึงวิทยุและสถานีโทรทัศน์ (เมืองโซชี และเมืองแอนาปา เป็นสถานที่ศูนย์รวมของการกระจายภาพและเสียงไปยังต่างประเทศ ด้วยระบบ HDTV. ↑ "Sochi 2014 Reveals its Slogan". Sochi 2014 Olympic and Paralympic Games Organizing Committee. 25 September 2012. สืบค้นเมื่อ 29 September 2012. ↑ 2.0 2.1 "News". sochi2014.com. สืบค้นเมื่อ 10 February 2014. ↑ "Vladislav Tretyak and Irina Rodnina lit the Olympic flame at the Fisht Stadium in Sochi". สืบค้นเมื่อ 4 March 2014. ↑ "Sochi Elected as Host City of XXII Olympic Winter Games, International Olympic Committee". Olympic.org. 4 July 2007. สืบค้นเมื่อ 17 January 2014. ↑ Oliphant, Roland (30 October 2013). 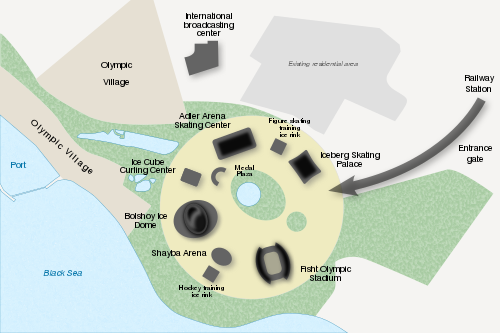 "Sochi: chaos behind the scenes of world's most expensive Winter Olympics". Daily Telegraph. สืบค้นเมื่อ 5 February 2014. ↑ Owen Gibson (9 October 2013). "Sochi 2014: the costliest Olympics yet but where has all the money gone?". The Guardian. สืบค้นเมื่อ 6 February 2014. ↑ "Sochi 2014 Confirms Ability to Self-finance in 2009–10". Sochi2014.com. 2 June 2009. สืบค้นเมื่อ 17 January 2014. ↑ ""2014 Winter Olympics Create New Opportunities for U.S. Ag Exporters", from Alla Putiy & Erik W. Hansen" (PDF). สืบค้นเมื่อ 2014-02-19. ↑ "Sochi 2014 Expects $300 Million Surplus". Gamesbids.com. 14 October 2011. สืบค้นเมื่อ 17 January 2014. ↑ "Sochi's mixed feelings over Olympics". BBC News. 26 November 2008. สืบค้นเมื่อ 17 January 2014. ↑ Madler, Mark (February 24, 2014). "WET Design Runs Rings Around Rivals". San Fernando Business Journal. Los Angles, California: California Business Journals. สืบค้นเมื่อ February 26, 2014. ↑ "California-based WET makes the waters dance at Sochi". Gizmag. สืบค้นเมื่อ February 26, 2013. ↑ "Behind Sochi's Futuristic Logo". The New Yorker. สืบค้นเมื่อ 4 February 2014. ↑ "Russian public to vote for Sochi 2014 mascot". InsideTheGames.biz. สืบค้นเมื่อ 5 February 2014. ↑ "Sochi 2014 chooses three mascots for Olympics as Father Christmas withdraws in row over property rights". InsideTheGames.biz. สืบค้นเมื่อ 5 February 2014. ↑ 24.0 24.1 "Mock mascot loses Olympic race, wins bloggers' hearts". Russia Today. สืบค้นเมื่อ 5 February 2014. ↑ "Mock mascot Zoich masterminded by Sochi 2014 organizers". Russia Today. สืบค้นเมื่อ 5 February 2014. ↑ "Mario & Sonic at the Sochi Winter Games & 3rd Sonic Nintendo Exclusive Revealed". Anime News Network. ↑ "Sochi 2014 Olympic Winter Games". Olympicvideogames.com. สืบค้นเมื่อ 2014-02-12. ↑ "The Sochi Stamp: A Sought-After Olympic Souvenir". Wall Street Journal. สืบค้นเมื่อ 11 February 2014. ↑ "US firm Avaya named as Sochi 2014 network equipment supplier". Insidethegames.biz. 30 November 2011. สืบค้นเมื่อ 17 January 2014. ↑ "Sochi 2014 Olympic Winter Games" (PDF). Avaya. 2013. สืบค้นเมื่อ 10 December 2013. ↑ "Инновационное олимпийское телевизионное оборудование впервые в Сочи". Broadcasting.ru. สืบค้นเมื่อ 9 December 2013. ↑ 37.0 37.1 "Sochi welcomes 2014 Winter Olympics with traditional Russian hospitality". En.itar-tass.com. Archived from the original on 2014-02-24. สืบค้นเมื่อ 2014-02-07. ↑ "Russia anti-gay law casts a shadow over Sochi's 2014 Olympics". Washington Post. สืบค้นเมื่อ 29 September 2013. ↑ Sam Sheringham (February 7, 2014). "Sochi 2014: Winter Olympics opens with glittering ceremony". BBC. สืบค้นเมื่อ February 7, 2014. ↑ "Record 88 nations to participate in Winter Games". Global News. Sochi, Russia. Associated Press. 2 February 2014. สืบค้นเมื่อ 2 February 2014. ↑ MacKenzie, Eric (16 January 2014). "Sochi Spotlight: Zimbabwe's first Winter Olympian". Pique Newsmagazine. Whistler, British Columbia, Canada. สืบค้นเมื่อ 16 January 2014. ↑ "Discover the twelve new winter sports events for Sochi 2014!". Olympic.org. 18 December 2013. สืบค้นเมื่อ 4 February 2014. 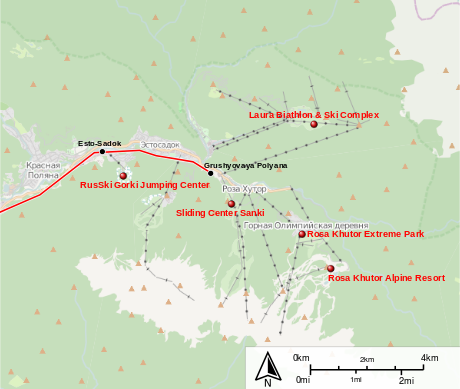 ↑ "Rogge announces three new disciplines for Sochi 2014". Russia Today. 5 July 2011. สืบค้นเมื่อ 6 July 2011. หน้านี้แก้ไขล่าสุดเมื่อวันที่ 9 เมษายน 2562 เวลา 08:48 น.